Fender Super 7250's Nickel-Plated Steel (NPS) strings combine the high output and dynamic sound of steel with the smooth feel of nickel; perfect for rock, funk and other styles of music where the bass needs to cut through. 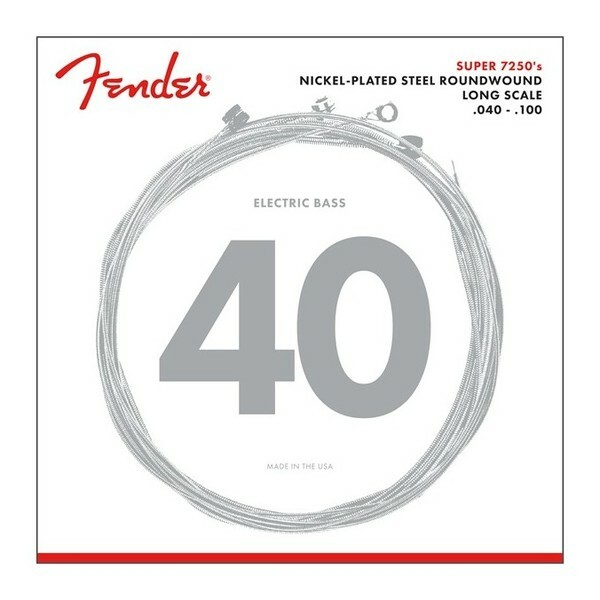 Fender Super Bass 7250's combine the high output and dynamic sound of steel with the smooth feel of nickel. The result is a string with bright highs and a thunderous low end. Fender Super Bass 7250's are an excellent all-purpose bass string. They are particularly good for rock, funk, and any style in which the bass needs to cut through. Fender String Construction: Nickel-plated steel roundwound. Tone Descriptor: Bright, with high output and a thunderous low end.